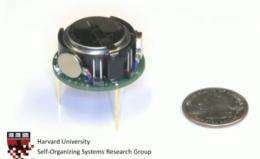 (PhysOrg.com) -- When you think about robots, the odds are that you think about something that is fairly large. Maybe you picture a robot arms bolted to the floor of a factory or if you are feeling particularly dramatic maybe you even pictured the terminator. You probably do not think much about tiny robots, but they have some big potential as a robot swarm. Enter the Kilobots. These small and simple robots are about the size of a US quarter that moves around on a set of vibrating legs. These small robots are able to communicate with each other by blinking lights mounted on their cases. While each individual unit may not seem that advanced or impressive the real impact is what happens when the robots work as a system. Swarms of hundreds or thousands of these robots, which each cost about $14 and take roughly fine minuets to assemble, are not designed to be used on an individual basis. The first group to be used by a research group at Harvard University is starting out with a group of 25. While this may not be the stuff of the nightmare scenarios of a thousands of horror movies as of yet these robots could easily be swarmed by the 1000's if the small scale testing goes well. The use of the robots does vary depends on how they are programmed. The robots can, for now, only understand simple tasks but with the help of the intelligence of the hive mind the swarm can be surprisingly responsive to the changing environment. This story a little bit funny, but the hilarious thing is NOT referring to the relationship between "KILL-obots" and swarms of robots. Did it need to be more obvious or something? so, how big a swarm will it take to do something practical, like run a spell checker? or are they really assembled by a rough, (but fine) french dance? Maybe they will assemble themselves into a giant robot blob and swallow the planet. In that that case, they should be called google bots. I suggest mounting a formidable defense against these killer hordes by installing wall-to-wall carpeting. This is proof of concept. Make them nano-sized, communicate differently, and they can accomplish almost anything. Nano-cloud Holodeck. Or nanite cloud bionics to augment human activity in symbiosis similar to mitochondria. They could be biosensors, maybe help in wound healing and delivery of medication, and maybe connect with the brain as a BCI. someday your computer/mobile device could be a wi-fi enabled nanocloud inside your bloodstream and in your cells. Seek and destroy cancer cells. This kind of thing is probably necessary for immortality. Anything could be fixed or perfectly cleaned. Manufacturing of most household items would be a thing of the past. Redecorate the house in seconds. I've read about the possibility of creating food with nanobots small enough, but not the engineering challenges.